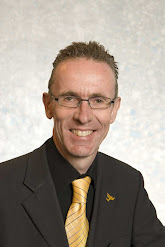 ScotlandsPeople is a superb on-line source of original genealogical information. 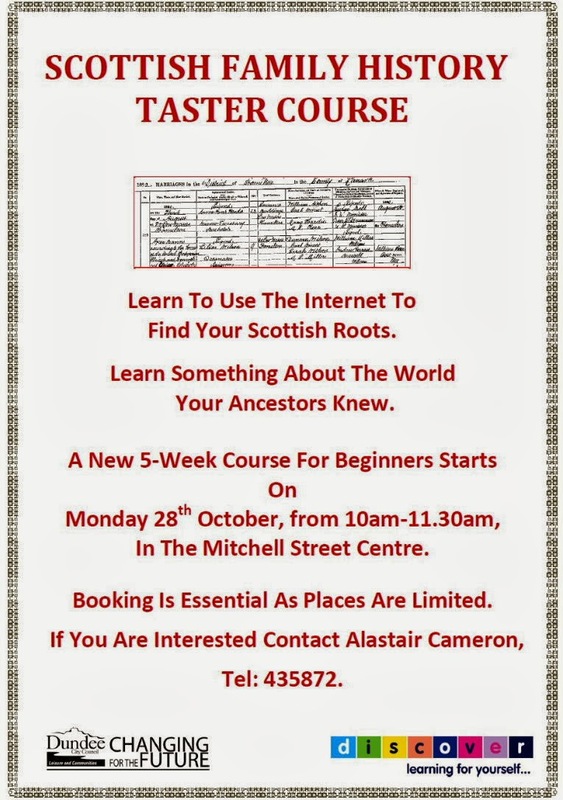 It is invaluable for anyone researching UK genealogy, Scottish ancestry or for anyone building his or her Scottish family tree. 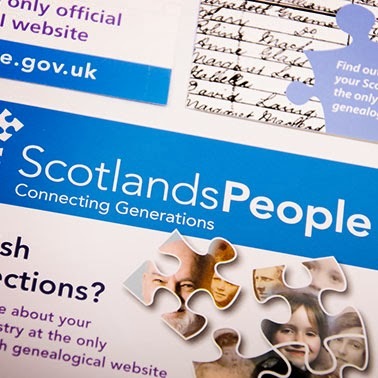 ScotlandsPeople has almost 90 million records available and a new, additional, resource was added last month with the addition of the Scottish Valuation Rolls for 1885. These 1885 valuation rolls include the names of owners, tenants and occupiers of each property. The named person in the roll is usually the head of the household and, in many cases, occupations are also listed. Since the rolls list every type of rateable property in Scotland, the records include people from all social classes. There’s fascinating information about the West End in 1885 to be gleaned from this resource and ScotlandsPeople highlights the properties in the West End associated with Sir William Arrol, the civil engineer who planned and supervised the building of the replacement Tay Rail Bridge. You can read more about Sir William Arrol here and view the valuation roll entry covering the property where he was tenant on ground at Tay Bridge Station owned by the North British Railway Company. The entry also includes the address of “47 Magdalene Green”, which would appear to be where the site office for the new Tay Bridge project was based. You can also view the valuation roll entry for a dwelling house at 24 Strawberrybank, where Arrol was also tenant. This would most likely have been Arrol’s main residence in Dundee during this time. ScotlandsPeople is well worth a visit and can be accessed at www.scotlandspeople.gov.uk. 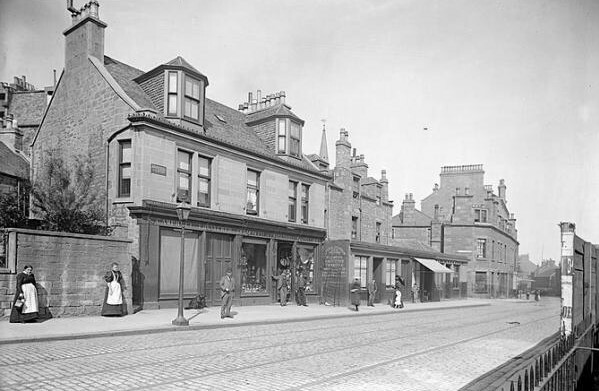 This last photograph of this short series of West End historical photographs is of Perth Road. 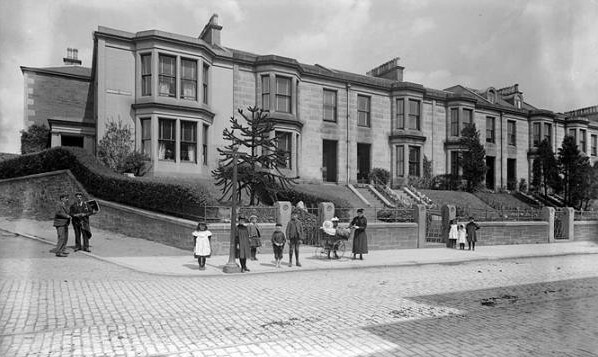 Although “Perth Road” is absolutely correct, residents of this section of the north side of Dundee’s Perth Road preferred to have their mail addressed to Windsor Terrace. 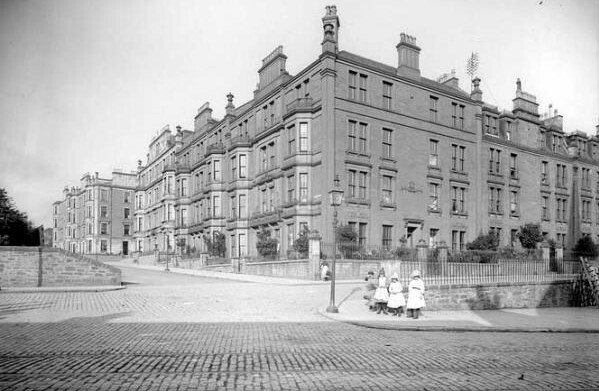 Residents of the block in 1895 included David Dewar, the superintendent of police, James Walker, Professor of Chemistry and University College, George Haggart, a solicitor, and John B. Hay, a builder. In 1905, three were still there: Haggart had been replaced by Henry William Rennie, a merchant. Mrs James Burdon [sic], a spirit merchant in 1895, has been replaced by Duncan Macnab Burden, a solicitor, at No. 2 by 1905. This photograph shows part of Dundee’s Perth Road, known as Invercauld Place, here leading eastwards towards the city centre. No. 153 was Sarah Campbell, a fruiterer, and No. 151 John Farquharson & Sons, ‘plumber, gasfitter, tinsmith & brassfounder’. George Christe, a grocer, had a shop at No. 149, and another fruiterer was at No. 145, John (later Mrs John) Peebles. No. 143 was the grocer, David (later Mrs David) Sewart and, beyond Pennycook Lane, which led northwards to Hawkhill, was a butcher shop, which was probably what is listed in the Dundee Directory as John Birse, flesher, at No. 133. St John’s Church, Perth Road : This impressive church, with its imposing spire, is situated on the corner of Roseangle and Perth Road. It was opened on the 14th February, 1884. The architect was James Hutton. 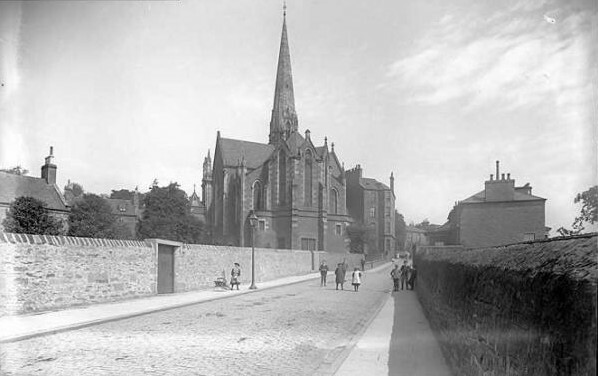 This church replaced an earlier church in Small’s Wynd which had been the first Free Church built in Dundee, in 1843. It was purchased by the founders of University College, Dundee and has since been demolished. 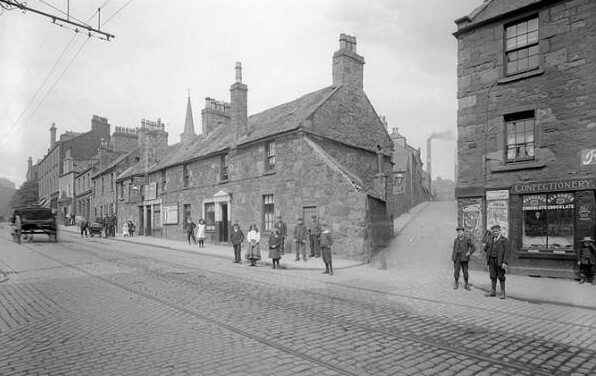 This photograph shows the junction known locally as Sinderins, where Dundee’s Perth Road and Hawkhill join at the foot of Blackness Avenue. James Maclaren, ‘a Soane medallist, and the best educated architect of Dundee’s Victorian age’ (David M. Walker: Dundee architects and architecture 1770-1914′), designed the uncompleted terrace Nos. 1-5 Blackness Avenue in 1868. Maclaren’s other work in Dundee included the famed Cox’s Stack (mill chimney) which still features above a leisure park in Lochee), the Savings Bank in Euclid Street and the Congregational Church in Broughty Ferry. He died of a heart attack in June 1893. The north side of Perth Road, Dundee, is seen in this Alexander Wilson photograph, which a mill chimney near the Hawkhill visible in the distance. Thomas Malone ‘the up-to-date boot repairer’ was at No. 101 Perth Road, with other shops at No. 6 Hilltown, No. 63 Hawkhill, No. 84 Albert Street, No. 158 Strathmartine Road and No. 19 Benvie Road. He lived at No. 20 Forebank Road. John Paton’s fish store was No. 99 Perth Road. To the east of West Wynd was Miss Helen Banks’ shop, listed in the Dundee Directory as ‘tobacconist and confectioner’. She lived at Gate Lodge, Invergowrie, a village to the west of Dundee.